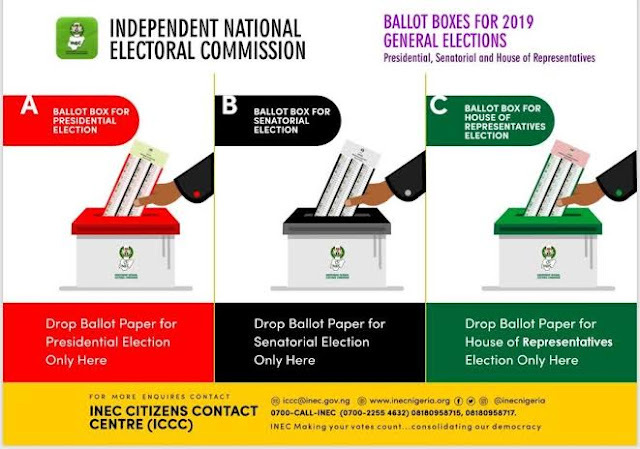 The Independent National Electoral Commission (INEC), has released the colours of the ballot papers and boxes for the Presidential and National Assembly Elections on Feb. 16. Mr Leo Nkedife, INEC Head of Voter Education and Publicity in Anambra, made the release available to the News Agency of Nigeria (NAN) in Awka on Thursday. According to the release, different colours of boxes and ballot papers will be used for the Presidential, Senatorial and House of Representatives ballots at the polling stations. The release stated that a red ballot paper and red box would be for the presidential election. It also indicated that a black ballot paper and black box would be for senatorial elections. It further stated that green ballot paper and green box would be for House of Representatives.